Fabian Perez "The Proposal IX" Hand Embellished Limited Edition Canvas (32x24); Hand Signed, with COA. "The Proposal IX" is a hand embellished limited edition giclee on stretched canvas by Fabian Perez. The piece is numbered and hand signed by the artist and comes with a Certificate of Authenticity. Measures approx. 32" x 24" (image). Born in 1967 in Buenos Aires, Argentina, Fabian Perez was fascinated by both martial arts and fine arts growing up. 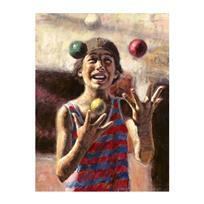 Karate in particular, taught Perez discipline, but also the grace and fluid movements that can be seen in his artwork. But before that, times were rough for the young man. With both parents dead by the time he was 19, Perez lived as a gypsy on the streets of Argentina for a few years, until finding his mentor and sensei, Oscar Higa, whom he eventually followed to Italy. He spent seven years learning to paint while he traveled, taught martial arts and even wrote a book entitled "Reflections of a Dream", which has also been published in the United States. 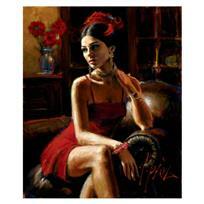 Fabian Perez "Linda in Red" Hand Embellished Limited Edition Canvas; Hand Signed, with COA. Fabian Perez "El Federal Café" Hand Embellished Limited Edition Canvas; Hand Signed, with COA. 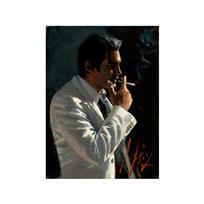 Fabian Perez "Marcus IV" Hand Embellished Limited Edition Canvas; Hand Signed, with COA. Fabian Perez "Abanico De Plumas" Hand Embellished Limited Edition Canvas; Hand Signed, with COA. Fabian Perez "Alegria I" Hand Embellished Limited Edition Canvas; Hand Signed, with COA. 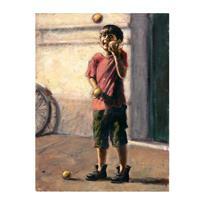 Fabian Perez "Alegria II" Hand Embellished Limited Edition Canvas; Hand Signed, with COA. Fabian Perez "Analie" Hand Embellished Limited Edition Canvas; Hand Signed, with COA. Fabian Perez "Analucia" Hand Embellished Limited Edition Canvas; Hand Signed, with COA. Fabian Perez "Analucia II" Hand Embellished Limited Edition Canvas; Hand Signed, with COA. Fabian Perez "Analucia III" Hand Embellished Limited Edition Canvas; Hand Signed, with COA.